25th Dec – Season's Greetings! 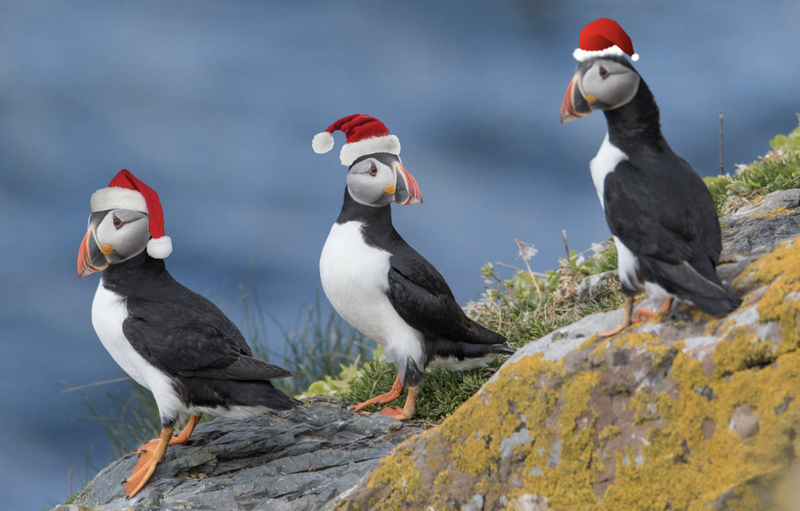 Merry Christmas and a very Happy New Year from the Lundy Birds blog – happy festive birding! "Unfortunately it has been super quiet bird-wise on the island bird since the last post. Unsurprisingly the weather hasn’t been the best with strong south-easterly winds dominating, then switching to the west, bringing with it some heavy downpours. There have been one or two really nice winter days in there though, which has allowed for better birding as well as a small night-time passage of thrushes, for example 35 Fieldfares on 12th Dec.
A single Great Northern Diver busily feeding in the Landing Bay on most days up to 20th. Other than this beautiful bird there hasn’t been much else out at sea other than some distant auks, the odd Kittiwake, Gannet and a 1st-winter Common Gull on 12th. Grant Sherman has been out checking his Guillemot sites, resulting in some decent counts on the ledges at St Mark's and Jenny’s, along with good numbers of Fulmar arguing over ledges on a number of days. A female Sparrowhawk was present in Millcombe up until 16th at least (perhaps the same long-staying female from November). Other raptor sightings have included Merlin, Kestrel and Peregrine. There are still some Woodcock, Snipe and Water Rail skulking around the island (mainly in Millcombe and at Pondsbury), while on the passerine front the island has been graced with small numbers of Chaffinch, Goldfinch, Linnet, a number of glorious Goldcrests, a male Stonechat, a lone Chiffchaff in Millcombe on a number of dates, and a single Firecrest on 12th. One highlight was the rediscovery of our lady Great Spotted Woodpecker in St Helen's Copse on 10th by Neil Trout. She has been heard/seen most days up until 19th when she was heard calling loudly in St Helen's Copse again. We also had a rather special non-avian visitor in the form of a huge Basking Shark off Rat Island on 14th. This sighting came as quite a surprise to everyone on the island as observations of these leviathans through the hefty swell this late in the year are rather few and far between. With me heading off home to the Emerald Isle on Saturday for some Christmas festivities, I am unsure if there will be any further updates until at least 29th Dec. Just in case there aren’t, I would like to take this opportunity to wish everyone a very Merry Christmas from the island and to say thank you to everyone who has submitted sightings or photographs over the past year. It has been a truly special one with some fantastic birds and even better birders on the island. Hope to see you all on the island in the New Year!" And a big thank you to you, Dean, from all Lundybirds blog readers for all your updates through the year. A very Merry Christmas to you and Zoë from us all. 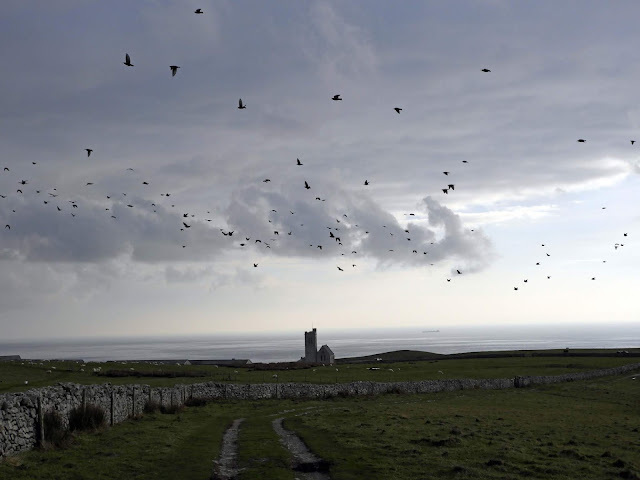 Lundy Warden Dean Jones, currently off-island, has sent the following update for the period 27th to 30th Nov.
A rather dull, breezy day and very quiet bird-wise, most birds having left Lundy, perhaps anticipating the stormy weather which was due to hit us the following day. Thrush numbers have dropped away a bit, with only a scattering of Redwings (9) and Blackbirds (7), a single Fieldfare and two Song Thrushes, along with an obvious reduction in Chaffinch numbers (3) compared to 26th. Not much else in the way of landbirds of note other than singles of Goldcrest and Chiffchaff (very vocal) in Millcombe and good numbers of Starling in upper Lighthouse Field. Unfortunately there has been no further sign of our ‘lady’ Great Spotted Woodpecker, perhaps due to the fact that Sue has run out of peanuts for her feeder! A brief seawatch during the afternoon saw a re-emergence of feeding Kittiwakes (181) off the Landing Bay after a prolonged absence due to strong easterly winds. Amongst the Kittiwakes were small numbers of Gannet (27), Shag (6) and one Fulmar, as well as around 30 feeding auks (mostly Razorbills), a single adult winter-plumaged Black-headed Gull and, most surprisingly, two Manx Shearwaters doing what they do best, shearing effortlessly through the hefty swell. The rain and wind picked up tremendously as forecast, making it extremely difficult to even stay on my feet in parts of the island, never mind record sheltering birds. I did manage to get out for a brief seawatch though the seabirds were much scarcer today than yesterday. In about an hour of recording I managed to see six Gannets, six Razorbills, seven Kittiwakes, two Lesser Black-backed Gulls, four Herring Gulls, two Great Black-backed Gulls and, again to my surprise, three Manx Shearwaters! Another very wet and windy day but slightly less so than the day previous. It is starting to feel much more like winter now, with very few birds on and around the island. Despite the weather I did manage to find a few thrushes hiding in sheltered areas on the east: eight Redwings, seven Fieldfares and five Blackbirds, along with five Goldcrests, four Chaffinches, a single Linnet, and a Great Northern Diver in the Landing Bay. The horrible weather theme and lack of birds continued. The Great Northern Diver was again in the Landing Bay, two Pied Wagtails were busily feeding outside the Tavern in the early morning, and small numbers of Chaffinch (4) alng with one Linnet and a single Redwing were the only real birds of note.